I started cycles. This is the first renders I made with it. 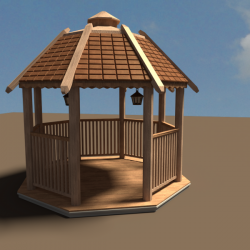 Unlike in preview, there are two gazebos in the blend file. Units in decimeters. The one in the preview is quite high poly. Second one is less so. Whole scene is 100k+ polygons. Current setup is for night. You could switch to day by disabling moon and lights and enabling sun. 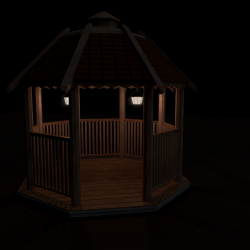 Wood texture is from Blender CD and skybox by Emil Persson. I like the colors, very smooth and soft. And the model is great, thank you for sharing this. It's great, but for game-art not useful, for game design you need to rethink the way of modeling, 100k polygons is way to much, for something like this you should set your limit to maybe 1000 and don't spend time on rendering, because in games it cannot be rendered, only real time graphics. Duion: you are thinking about 3D games. 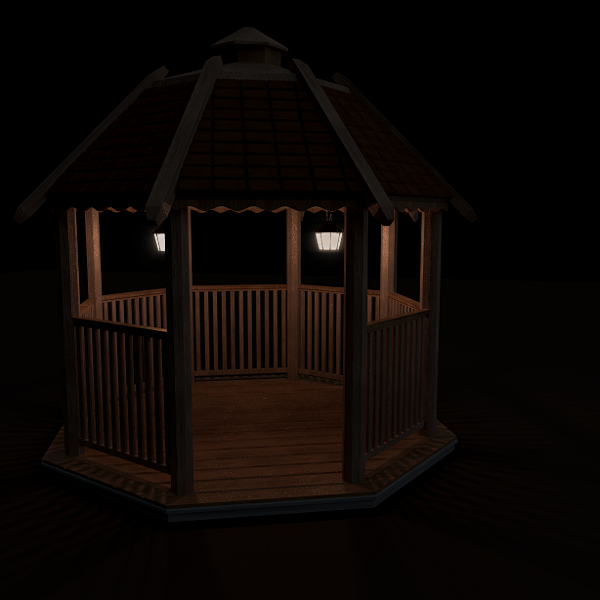 It can easily be rendered for an isometric game. See Flare. All you'd have to do is decimate it and bake a normal map onto the low-poly version. Very nice model! If you really need a low poly version, you should to do it manually. 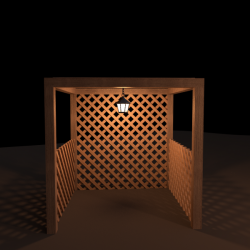 Remodeling from scratch using this as a reference could be easier(textures are already there and it is symmetric). Just wanted to mention, that this cannot really be used for 3D games.